Each week we bring you a little insight into Israeli society through a graph that illustrates an important aspect of a larger story. 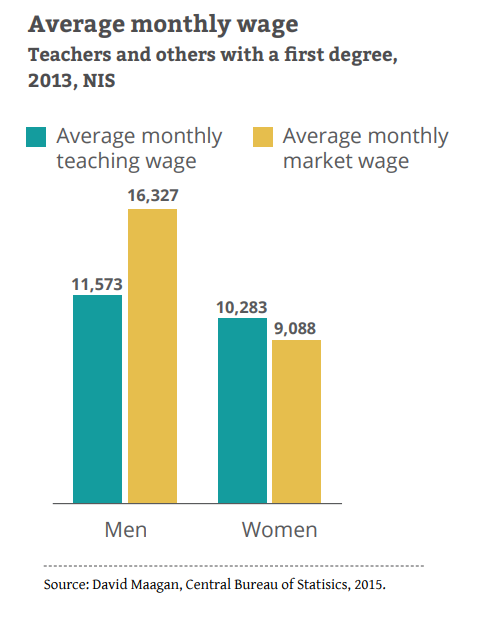 Male teachers earn less and female teachers earn more, on average, than their counterparts with an academic degree. Compared to others who have at least a Bachelor’s degree in Israel’s work force, male teachers still earn much less than their counterparts with academic degrees – 27% less in 2013. Although female teachers have lower average salaries than male teachers, they earned 13% more than their female academic peers in 2013. One of the most influential factors explaining the difference in average wages between the genders is differences in field of study and occupations pursued by men and women. With regard to teacher salaries specifically, the real wages of teachers in primary school education in Israel rose by 26% from 2005 to 2013, the wages of middle school teachers rose by 19%, and of high school teachers by 10% – a significant improvement in comparison to the development in wages in other OECD countries. Is Israel prepared for an aging population?